Part food for thought, part thought for food. Needing some Q&Q (quick & quiet) time last week, I decided to drop by Aix on Centre Place (near Degraves Street) for lunch. Decided to be a bit of a pig and ordered a savoury crepe - field mushrooms, taleggio cheese, and spinach ($8); and a sweet one for dessert - good ol' lemon & sugar ($5). The crepes are made so well here! Of course, once it's been folded up it's hard to appreciate the delicate thin crepe for what it really is. 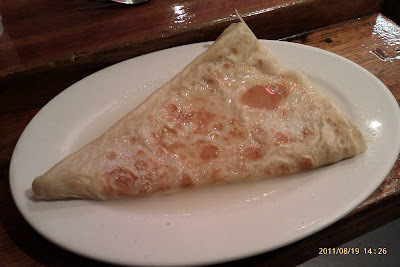 This place uses the same crepe batter for their sweet and savoury crepes - and I like it :) Most other creperies use buckwheat flour to make their savoury crepes (called galettes). This savoury crepe is the one that I order EVERY time I eat at this place. Took me a few minutes to muster up the courage to whip out my phone (yes, I'm still using my phone to take photos) to photograph the crepes. I think I need to practice doing this with more confidence... 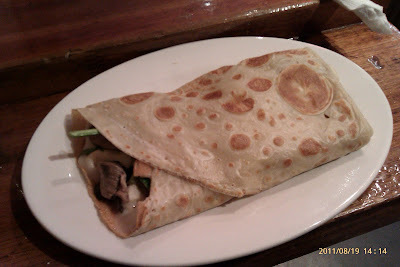 But anyway, back to the crepe - I just can't seem to order any other crepe because this one is so well-balanced in terms of flavours and textures that I know I won't be disappointed :p The salty and gooey taleggio cheese, the crunchy spinach, the soft but firm field mushrooms. Oh man. I was a little surprised when the lemon & sugar crepe came out - there was the crepe sitting in the plate, drenched in lemon juice!!! I was worried it would be too much lemon. This crepe also came topped with a generous amount of sugar. Yikes? Not! It all made sense as I dug into my crepe - the lemon juice was soaked up by the crepe, yet somehow the crepe managed to stay moist without getting soggy (amazing?! ); and the sugar was definitely needed to balance out the acidity of the lemon juice. Together, it wasn't too sweet at all. Love. They also make other things like lasagna using crepes as the pasta layers, and salads and sandwiches. I am yet to try them because I always go there for the crepes. Having spent 6.5 years in Melbourne as a student and then as a consultant in the corporate world, I decided it was time to go back to school. I am now temporarily based in Cambridge. 2.5 years have passed with me not documenting any of my culinary escapades on this blog (very few in Cambridge, very many in other parts of Europe). I hope things will be different from now on.